Whether you’re staring out at a sunset over the Pacific or gazing at the skyline of Downtown Los Angeles, nothing beats a cool, refreshing drink with a view. The added ambiance that comes with a spectacular setting enhances the mood, a conversation between friends, and is the cherry on top of a delicious evening. 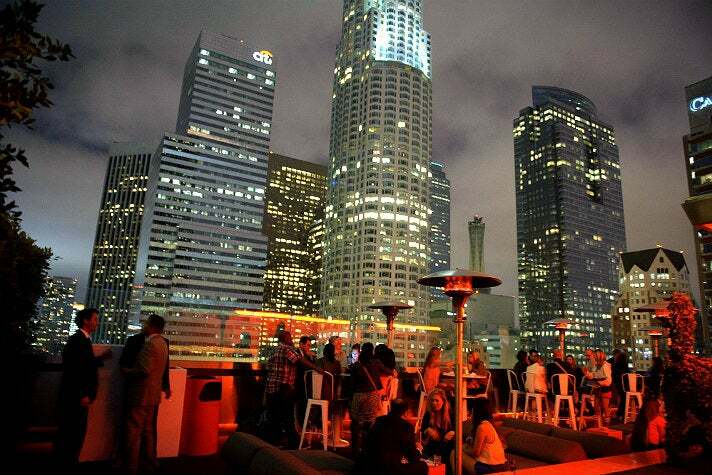 Here are the top 10 Los Angeles bars with a view. 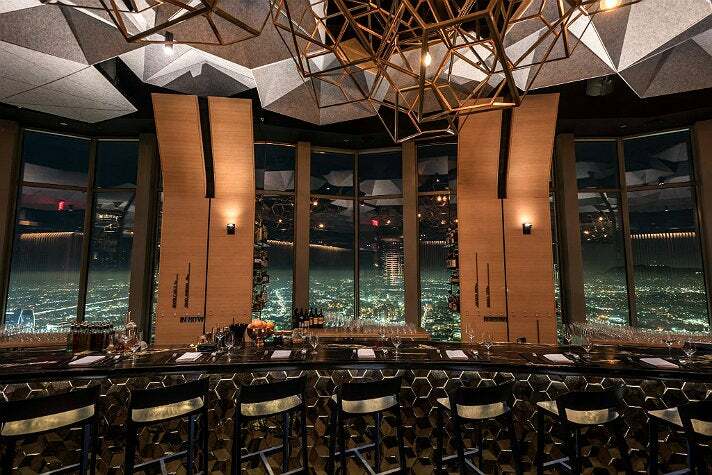 One of L.A.'s hottest new dining destinations, 71Above is the highest restaurant west of the Mississippi, located in the iconic US Bank Tower. 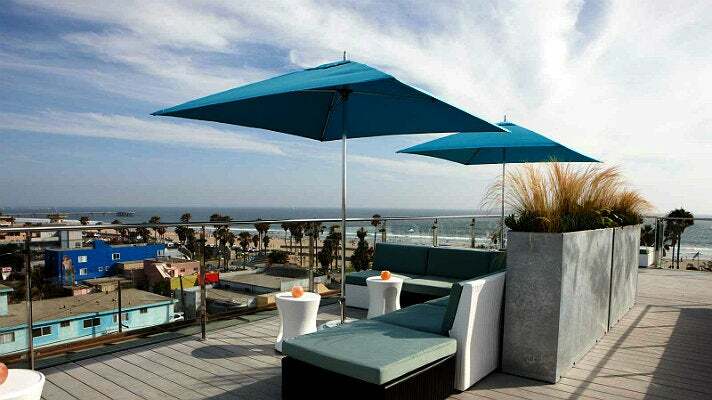 Featuring elevated modern American cuisine by Chef Vartan Abgaryan, 71Above boasts spectacular ocean views from Malibu to Laguna Hills, along with the Los Angeles basin and the surrounding mountain ranges. 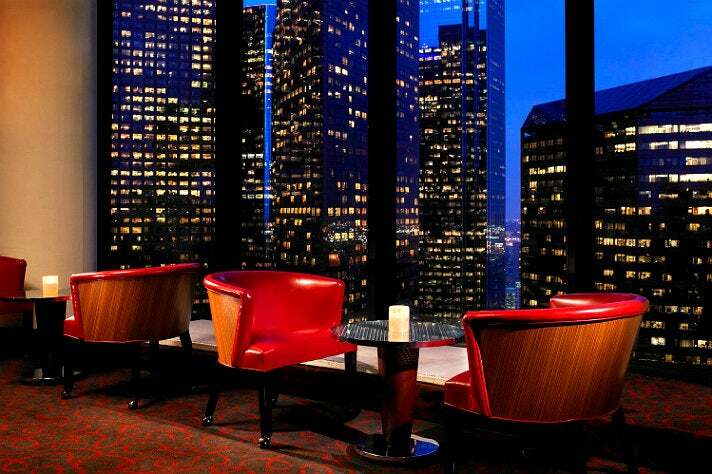 Sip a Vesper at the elegant bar, admire the views and imagine you're 007 (and the cocktail's namesake Bond girl) about to step into the night. After a couple drinks it may feel like you’re spinning in the Bona Vista Lounge at the Westin Bonaventure, but it’s actually their own revolving lounge floor. Pretty sweet, right? As you take the glass elevator up to the 34th floor, you’ll be anticipating the view that awaits you, and rightfully so. This one’s a stunner. Treat yourself to a delectable appetizer and a specialty drink served in souvenir glassware. Cheers! 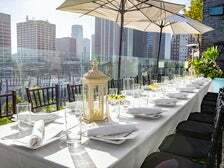 Located on the rooftop pool deck of the Freehand Hotel in Downtown L.A., Broken Shaker offers an eclectic menu of craft cocktails and small bites in an urban setting that's tailor made for Instagram. A James Beard Award finalist and winner of Tales of the Cocktail’s Best American Hotel Bar award, Broken Shaker serves up refreshing drinks infused with homemade elixirs and exotic ingredients, bringing coastal flavors to the center of the city. 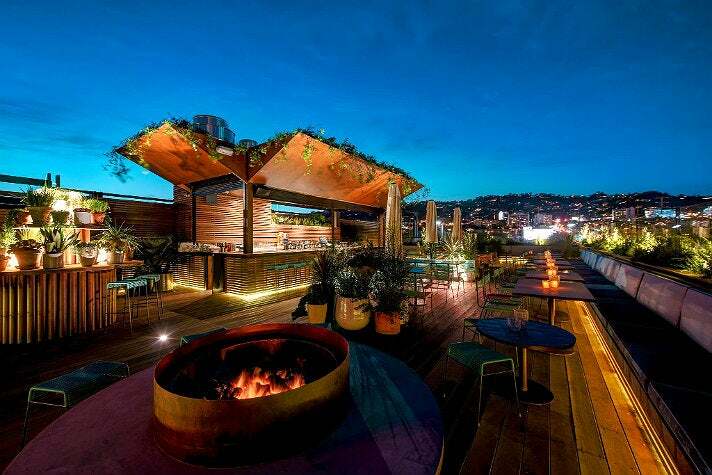 This picturesque rooftop bar offers breathtaking views of the Hollywood Hills as well as its West Hollywood surroundings. Sip a craft cocktail under string lights while you catch the sunset, then huddle around a fire pit as the city lights come up. The rooftop bar offers non-traditional bar bites with an Asian flare, including bao, tofu fries and curry shrimp. Those with a sweet tooth should go for the soy caramel popcorn – the perfect complement to any drink. Hitting the Pacific Coast Highway for a beach day? 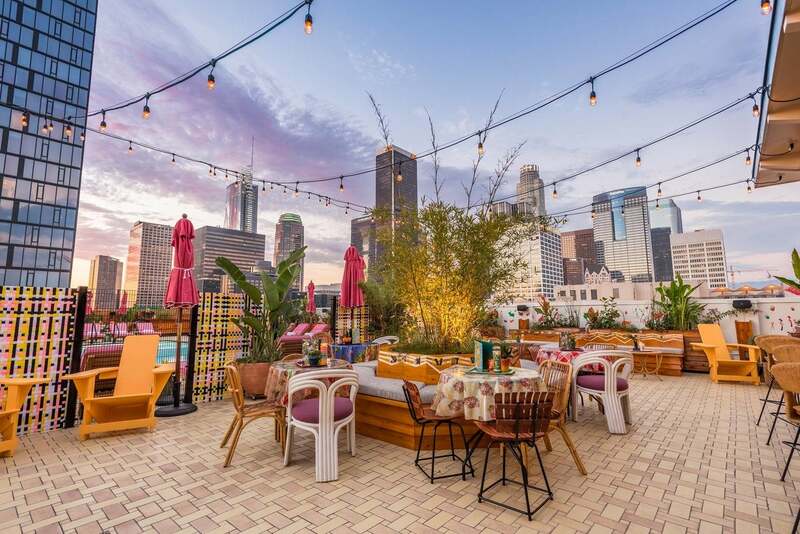 Make sure you make a pit stop in Venice, which not only has some of the best people watching in town, but also boasts breathtaking views from the High Rooftop Lounge at Hotel Erwin. High is special for many reasons, particularly because this kickback bar is the only one of its kind in Venice. 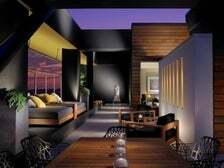 Combine panoramic Pacific views, a DJ to set the mood, and intimate, cozy couches (blankets included!) and you’ve got the recipe for a relaxing evening. Whether you’re there to cool off with a delicious Treetop or if you want to keep it old school with a classic Hemingway, High offers a must-see view that’s perfect for that first date or group birthday party. 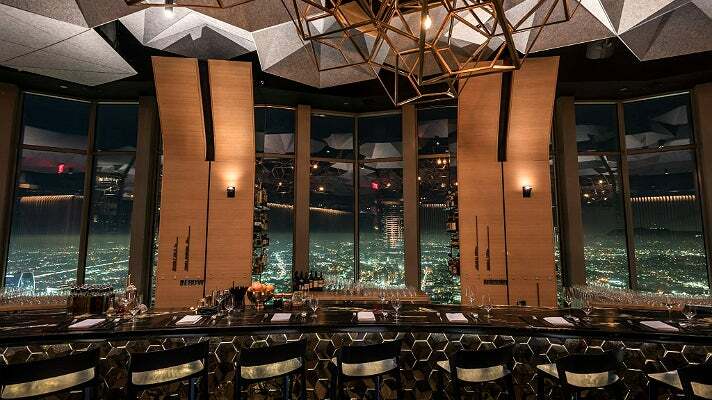 As Downtown continues to tantalize us with its growing nightlife scene, we can’t help but start this list off with Perch – one of Downtown L.A.’s sexiest bars. What better way to get a view of the sparkling city lights than from a spot nestled on the 15th floor above South Hill Street? This restaurant, bar and lounge offers its guests fire pits, indoor and outdoor seating, and tasty French fare. If you’re thirsty for a Parisian-inspired cocktail or looking to cool off with a craft beer, this just may be your new spot. 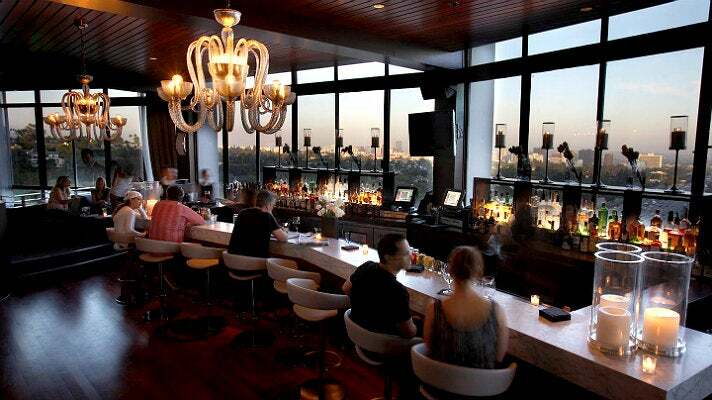 Choose a seat at the bar or wrap yourself around the balcony, and enjoy unobstructed views of the City of Angels. You can thank us later. 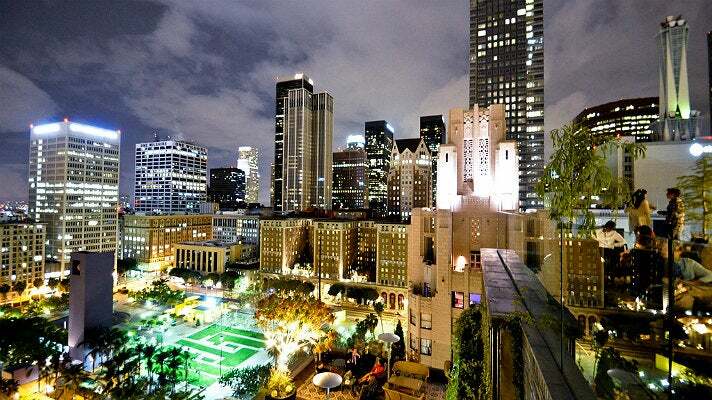 Housed in a mid-century landmark, The Standard, Downtown LA hotel features a rooftop bar known simply as The Rooftop. 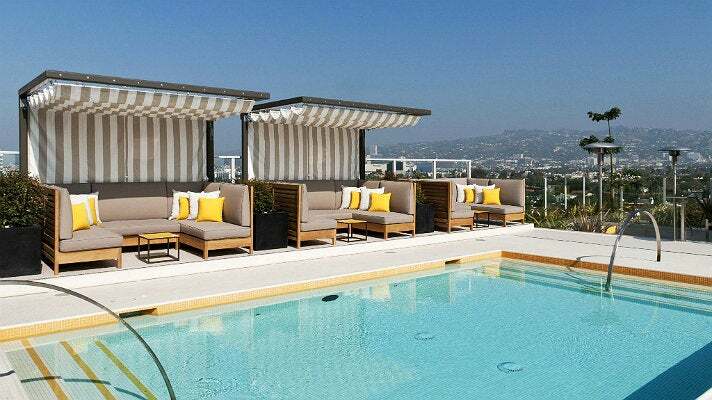 Exuding cool and complete with a heated pool, fire pit and endless views of the city, The Rooftop treats guests to nightly DJ sets, waterbed pods and a Biergarten. Beifall! Looking for a new backdrop to your weekend plans? Enjoy the twinkling city lights as you nosh on small plates paired with the bar’s specialty cocktails. 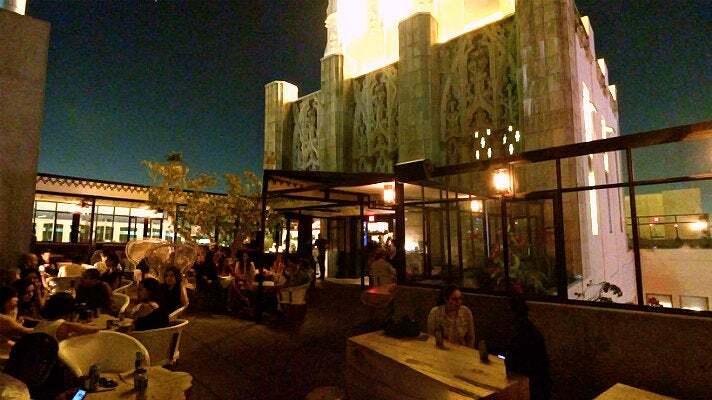 We have two words for The Roof on Wilshire: comfortable and classy. With spectacular views of the city, guests can cozy up with their friends and enjoy a craft cocktail paired with Chef Eric Greenspan’s American bistro cuisine after a hectic work week. Their poolside cabanas offer shade to cool off and the fire pits bring comforting warmth during chillier evenings. 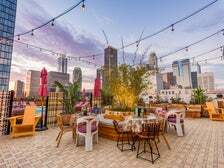 If you’re looking for a modern twist on a tropical cocktail or a fancy frozen drink to excite your taste buds, Upstairs, the rooftop bar at the Ace Hotel in Downtown L.A., just might be your new after-work hang out. 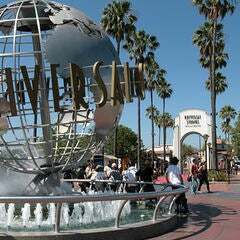 The view is something you must see for yourself. Dip your toes in the pool as you rock to the DJ's jams and zone out under the city’s umbrella of stars. And while you’re there, discover the structure’s magnificence – the Ace Hotel, which opened in 2014, is housed within the historic United Artists building, built in 1927 for the maverick film group. 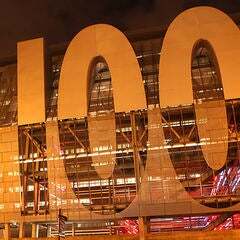 How’s that for a history lesson? 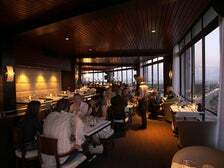 Situated on the 17th level of Hotel Angeleno, West Restaurant and Lounge is a swanky and inviting space with great food and an even better view of the distant city lights. With live jazz music, tasty happy hour selections and a full drink menu, it’s no wonder guests stop by for a visit, even if they’re not staying at the hotel. 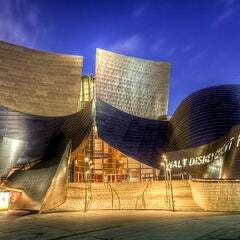 Conveniently located off the 405 Freeway, West offers an easy, sophisticated experience that’ll have you feeling like the regal individual you are. 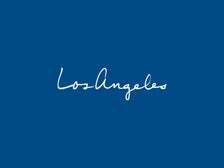 603 N La Cienega Blvd.